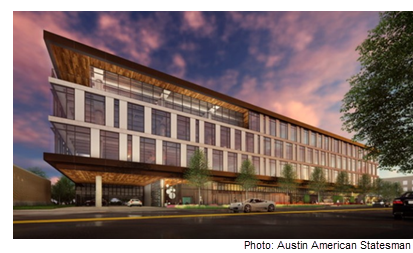 ​AUSTIN – A marketing platform for local businesses, Main Street Hub, has signed a lease to occupy a new 114,000-sf building on Austin's East Side, starting in 2019. Upon completion, the four-story headquarters will have room for over 1,000 employees. The new office building is situated on East 6th St. between Chicon and Robert Martinez, Jr., Streets. Main Street Hub currently has three offices—two in downtown Austin and one in New York City. In preparation for its Austin expansion, the company also is announcing that it is relocating its New York-based teams to Austin. The relocation will bring over 100 new jobs to the city. ​Check out more office stories across Texas​.